With graduation quickly approaching, I’ll admit, I’m having a bit of a mental breakdown. My mom keeps calling about plans for commencement weekend, there’s talk of new jobs and apartments, and the only thing standing between me and the real world is one measly paper. It’s freaking me out. The logical thing to do at this point would be to get my paper out of the way, plan a big graduation bash, and enjoy the last cherished weeks of college. But me? I’m digging my heels in. As excited as I truly am about the opportunities that await me in my next stage of life, I’m really gonna miss this place. So, I decided to cook instead. Playing in the kitchen has long been my procrastination method of choice. Test tomorrow? Time to bake cookies. Internship application deadline coming up? Let’s give risotto a try. With my future knocking, I needed a recipe that would keep my hands busy and my mind occupied, and gnocchi seemed like just the thing. I’d always wanted to try making gnocchi, but every recipe that I read called for a potato ricer or food mill. I like to thing that I have a fairly well-stocked kitchen artillery for a college student, but lack of the necessary tools left me feeling dejected. Hence my excitement when I came across a method made just for the utensil-oppressed like myself! A post over at Smitten Kitchen assured me that I was not alone, and that I would only need a simple grater to get the job done. As a first-timer, the whole process probably took about three hours, but it was a really fun way to spend a lazy weeknight. Making perfect ridges on the little potato pillows is not an easy feat, but they tasted delicious all the same. Now that I’m armed with a full stomach, maybe I’ll go start that paper. Hannah Doolin is a magazine journalism major at Syracuse University. Despite her professional procrastinating skills, she manages to get her homework done while the cookies are baking. 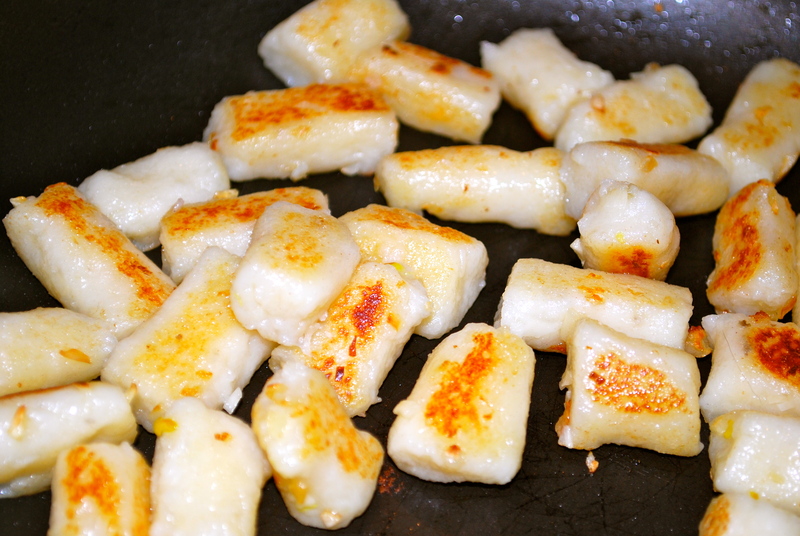 After cooking the gnocchi, I browned them in a pan with butter and garlic. I would highly recommend this, as it makes them a bit crispy and a little more flavorful. Add the flour to the potatoes a little at a time, using only as much as you need so that the dough will not stick to your hands. When the flour has been incorporated, bring the dough together with your fingertips. Dump the dough and any remaining floury bits onto a slightly floured surface. Knead the dough as you would bread dough. Press down and away with the heel of your hand, fold the dough over, make a quarter turn, and repeat the process. Knead for about three or four minutes. Form the dough into a ball and then divide it into 6 smaller balls. On a lightly floured surface, roll out one of the six pieces using your fingertips into a long rope about 3/4 inch thick. Cut the dough into 1 inch pieces. 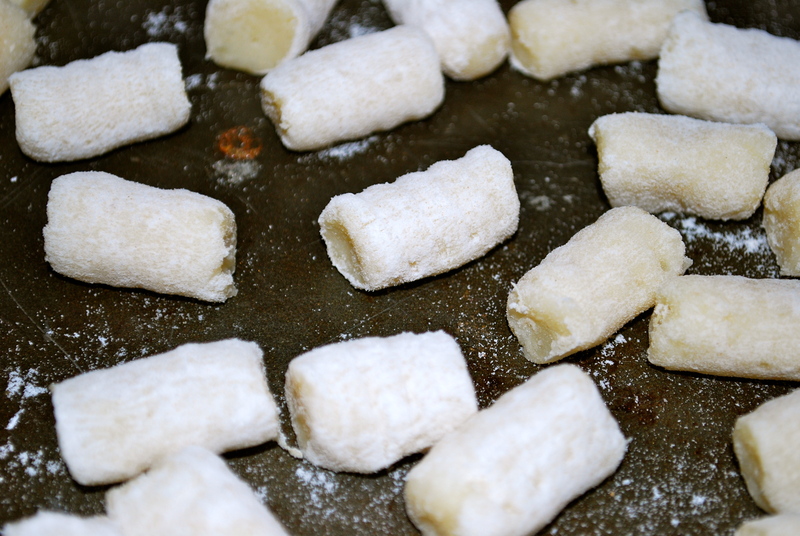 You can cook the gnocchi as it is now, but traditional gnocchi has ridges. To create the ridges, press each piece of dough against the tines of a fork. With your finger, gently roll the pressed dough back off the fork. This takes a little practice. 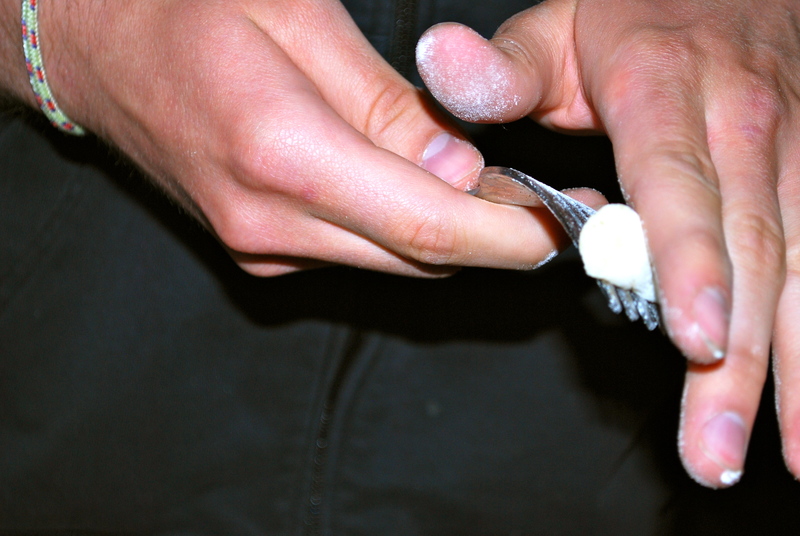 If you find the dough sticking to the fork, dip the fork in flour before you press the dough against it. Categories: Campus Cooking and Recipes. I'm Cooking For...: Dates, Meatless Mondays, Myself, and Winter. I Don't Eat: Dairy and Meat.